Mitochondria produce the majority of cellular energy via the “slow burn” of substrates such as glucose, free fatty acids and ketones. In diabetes, altered mitochondrial energetics and substrate utilisation may explain, in part, an organ’s susceptibility to complications. This is particularly evident at sites such as the kidney, heart, neurons and retina, which have high energy demands and oxygen consumption rates to meet functional requirements. 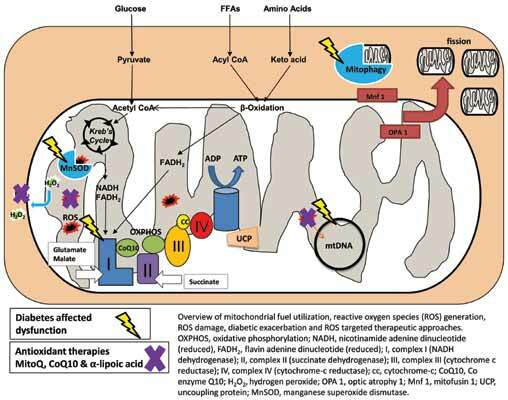 Within this review we highlight the recent research implicating mitochondrial dysfunction, with particular focus on the contribution of mitochondrial reactive oxygen species, on the development and progression of diabetes complications. Finally, we discuss the current strategies which are being assessed to combat mitochondrial dysfunction in diabetes complications. Diabetic complications, mitochondria, nephropathy, networking, oxidative phosphorylation, retinopathy, ROS, superoxide. Mater Research Institute, University of Queensland, Translational Research Institute, 37 Kent Street Woolloongabba, Queensland 4102, Australia.